The herb is characterized by its solitary and tapering floral stalks, each of which can be six to nine inches in height. It also has marked creeping scions or runners on the ground - these structures are elongated shoots, that can reach a couple of feet or more in length, they are sent out from the rootstock in all directions and help the plant spread out on a site. The stems of the bugle are marked off at intervals by pairs of leaves. At the point where pairs of leaves appear, rootlets are given off to the ground below, these rootlets enter the earth and root themselves - this is one way in which the plant propagates itself over a site. When winter comes, all the runners on the ground die, however, on all the places where the leaf pairs and the rootlets were seen lies a dormant plant which will develop into a full plant when spring arrives. Bugle blooms towards the end of April and flowers last until the start of July. Bugle is characterized by having erect floral stalks that are sent up from the root stock as square stems, these are pale green in color and are often purplish in coloration on the upper surface. The leaves are borne on the stalk in opposite pairs. Stalks can be seen on the lower leaves, while leaves on the upper side are stalk less. Each individual is oblong and obtuse in structure, being serrated or mostly entire along the margins of the lamina. Each surface of the leaf bears many celled hairs, the margins of each single leaf is also fringed with a lot of hairs. The runners on the bugle have a very smooth surface; however, the stems of the bugle are only smooth along two of the sides, the two other sides being somewhat downy. 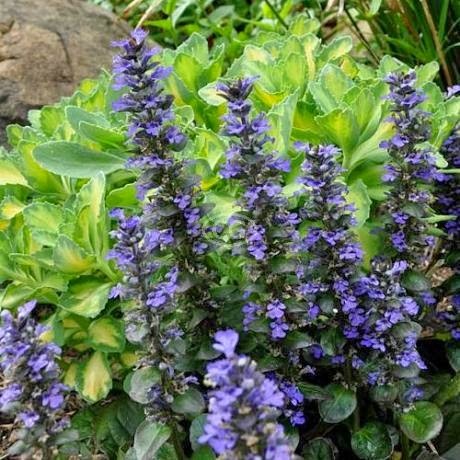 Bugle flowers have a purplish blue coloration. All the flowers are crowded into a single spike formed from about 6 or more rings of the floral whorls, usually each single whorl will bear 6 flowers. Bracts - the upper leaves - are often interspersed amid the whorls, these also have similar coloration. This is the main reason for the fact that the entire upper portion of the bugle plant has a bluish look in most cases. Bugle flowers also come in a white variety occasionally found in the wild, in such plants the upper leaves retain the normal green coloration of the lower portions of the plant. The bugle at any rate had a great reputation in older eras, and was once though to possess great curative powers and a potent medicinal property. Herbalists have also traditionally used remedies made from the bugle to stop internal bleeding in the lungs as well as to stanch other kinds of internal hemorrhaging in other parts of the body. In addition, remedies made from the bugle has been recommended for treating problems such as persistent coughs, in treating ulcers, in the treatment of rheumatism, and to treat all kinds of liver disorders. Bugle has also been used to prevent hallucinations following the consumption of excessive amounts of alcohol. Research into the purported health benefits of bugle is limited. However, bugle has been of interest to modern medicine for its potential to regulate thyroid hormones. 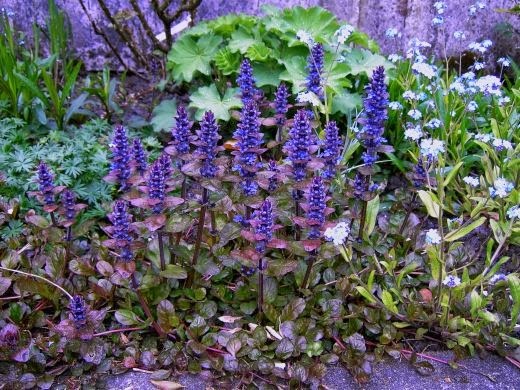 In Europe, Bugle (Ajuga Reptans) has long been valued as a wound healer and Nicholas Culpeper praised it in 1652, stating that a "decoction of the leaves and flowers made in wine and taken, dissolveth the congealed blood in those that are bruised inwardly by a fall or otherwise, and is very effectual for any inward wounds, thrusts, or stabs into the body or bowels". Native to northern England, Bugle has a history of use as an ingredient in medicinal remedies. Historical documents indicate that bugle was originally prepared as a syrup, and later as an ointment which was applied to wounds. The herbalist, Mrs. Grieves, writing in 1931, reported that it lowers the pulse rate and "equalizes the circulation". The bugle tastes bitter, it is also a potent astringent, and aromatic as well. However, there are differing opinions on its value as an herbal medicine. In addition, the bugle also possesses mildly analgesic properties, and it is still used from time to time in herbal medicine as a wound healing herb. Traditionally, the bugle has also been used to cleanse and detoxify the liver, and the herb is also said to have a mild laxative action. Ground pine is used to treat gout and rheumatism and it is also believed to have diuretic, menstruation-inducing, and stimulant properties. The remedies made from the bugle are specifically used for treating over-active thyroid glands and the symptoms such a disorder induces in the body, particularly if these physical symptoms include problems such as tightness of the chest when breathing, cardiac palpitation and shaking or quivering muscles. Whenever cardiac palpitations are of nervous origin, it is quite safe to use the bugle as an herbal relaxant. A Chinese variety, A. decumbens, is used as an analgesic. Although not much used in herbal medicine, bugle is still occasionally is made into a wash to be used for wound healing. A gargle or mouthwash with bugle is an effective treatment for inflammations of the mouth and larynx. Bugle Infusions were sometimes used for gallbladder and stomach disorders. The bugle is also used as a major herbal sedative in cases of cough, it helps to relieve and ease irritating coughs, particularly when such persistent coughs come about due to nervous disorders.